Dreher, Axel and Steffen Lohmann. 2015. 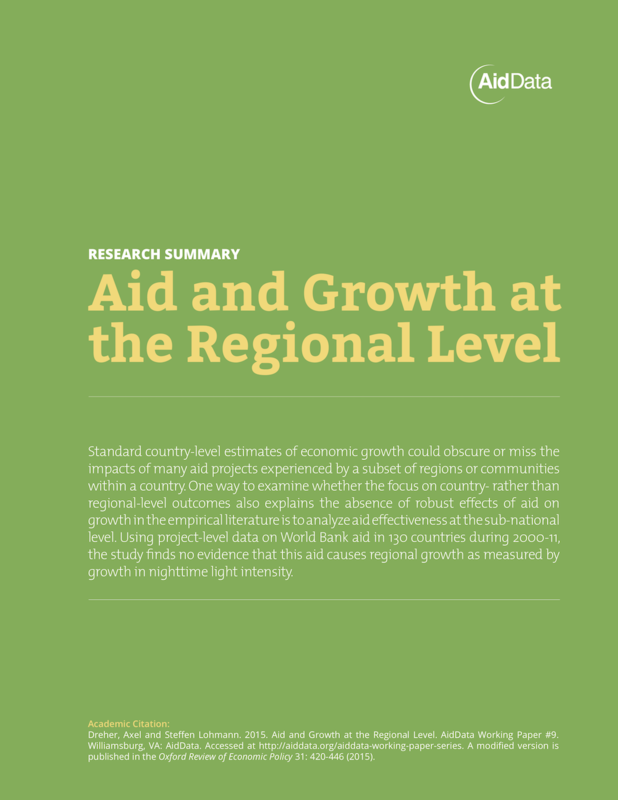 Aid and Growth at the Regional Level. AidData Working Paper #9. Williamsburg, VA: AidData at William & Mary. Standard country-level estimates of economic growth could obscure or miss the impacts of many aid projects experienced by a subset of regions or communities within a country. One way to examine whether the focus on country- rather than regional-level outcomes also explains the absence of robust effects of aid on growth in the empirical literature is to analyze aid effectiveness at the sub-national level. Using project-level data on World Bank aid in 130 countries during 2000-11, the study finds no evidence that this aid causes regional growth as measured by growth in nighttime light intensity.